Big-screen Lumia 625 uncovered; what is Nokia up to? The Nokia Lumia 625 could well be on its way after details on the handset surfaced in China alongside a couple of snaps claiming to show off the Windows Phone 8 device. 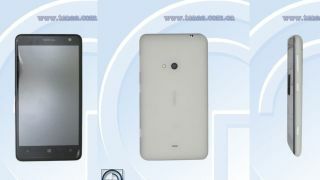 Details were spotted on the Tenaa website and reveals the Lumia 625 will likely pack a 1.2GHz dual-core processor, 512MB of RAM, 5MP rear camera and front facing VGA snapper. These specs aren't particularly stellar, but considering the Nokia Lumia 625 will probably replace the current mid to low-end Lumia 620 that's not a huge surprise. What has piqued our interest however is the screen, potentially measuring in at 4.7 inches - which would really make it stand out in terms of size, at least at the bottom of the market. Sadly though the quality of that rumoured display may not be all that great, with the listing pointing towards a WVGA (800 x 480) resolution which could lead to a pretty pixelated showing. As well as the images of the Lumia 620 there's also a details on the dimensions and weight of the handset, with it measuring up at 133.2 x 72.2 x 10.5mm and tipping the scales at 161.5g. This is a pretty extensive leak, providing us with a lot on information about the potentially new handset and considering Nokia has recently launched the Lumia 925 to replace the Lumia 920, the Lumia 625 certainly isn't out of the question.